Still time for free cards - Click Here for details. Over the next 30 days, I will drive west to Denver, and then east to New York about 10 days after returning from the mountains. Not sure how much cardboard will be involved. I have a couple ideas, but who knows what will fit in. Denver is a play it by ear. New York has a semi strict itinerary. I really need to get to my scan folder. It's getting too full, so I hope you (and by you, I mean the guys I highlight) will forgive if I do some lumping over a few posts. There has been lots of sweet cards coming in, covering a wide range of collections. Shane over at Reds Card Collector had a May the 4th contest for a complete insert set from the Chrome Perspectives set. I lucked out to be at the top of the Random list. Scans don't do the whole set justice. Here is just 3 of the 10 cards. Love the whole wanted poster idea of the cards, with Grievous, Vader, Dooku and other Star Wars villains appearing on cards. Thanks for the contest, Shane. Corey at Tim Wallach dropped a fat PWE on me. I almost have an envelope ready to head back in return. Corey sent a nice collection of White Sox and Blackhawks, some shown shown above. I love getting vintage of 1980 Olympic gold medalists. O'Callahan didn't have a long NHL career, but as the only member of Team USA that came to Chicago, I'll take it. Should have a return to you within a month, I hope. Some more Blackhawks, these in a #Supertrader envelope from Adam at Cardboard Clubhouse. I dropped a decent Reds package to him, and he outdid it in return. Lots of Hawks via full junk wax team sets. What wasn't an addition to a year section of the Hawks box filled in missing cards for the team sets. Great bunch of 80's and 90's stars with the 3 pictured. Two Hall of Famers in Goulet and Savard. And would they just put Grandpa in already? Com'on, NHL. How about some baseball set fills as well? I'll have to double check, but I still don't have the complete Fleer set pictured. I know - right? What the hell is wrong with me. Psycho Steve was needed, though. So was the '92 SC of Sax and a game card of closer Hernandez. For a few years, he was lights out when handed the ball in the last inning. Remember the idea of Stadium Club? Exclusive cards and all this other perks. I actually was (is?) a charter member. I believe my charter set, with medallion, is in a box in the basement. I would go look for it, but I would probably find another 10k stash of cards my wife tucked away in a cleaning binge and I really just don't have the time for that. Still have the shoe box full from the last one to sort out. The star of Adam's package is this sealed White Sox Stadium Club team set. I have NEVER seen this before. 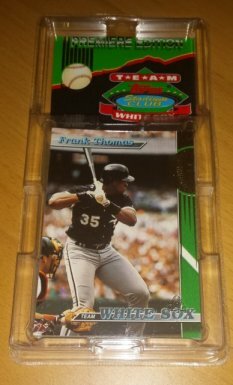 30 cards within, with the usual names of Thomas, Ventura, Fisk, McDowell and others from 1993. But there are other names forgotten. 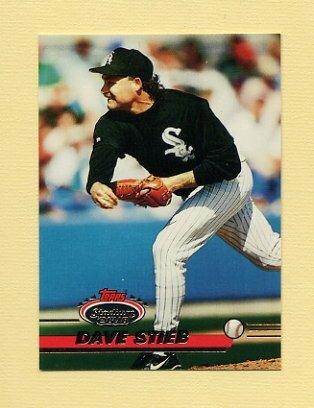 Remember when Dave Stieb was a member of the White Sox? Or Ellis Burks? Terry Leach? Not a lot to remember, even if the club did win the West Division that year. Not sure if I should open this or not. Thanks for the cards, Adam. That's some down. Some more to go. Glad you liked the cards Jeff. I'm already setting more Sox cards aside for you for the next pack. NY you say.. Anywhere near me? Have a good trip. Drink some good beer! Great post Love the Star Wars cards. When you come through Denver, don't miss Mike's Stadium Sportscards. Good guy; he's thrown the first pitch at Coors Field once and he sold me my '62 Mantle. Glad you liked the cards Jeff!